Do you eat large amounts of food even when you’re not hungry? Do you sometimes eat more rapidly that normal? Do you eat alone because you’re embarrassed by how much you eat? Do you ever feel disgusted with yourself, depressed, or really guilty after you eat? Do you starve yourself after a binge only to repeat the same cycle over and over and over again? Am I Hungry? 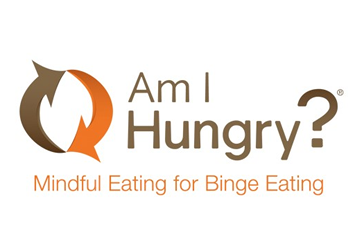 Is a mindfulness program for emotional eating and binge eating. Created by Dr. Michelle May. The program offers powerful tools to help you understand and address why and how you currently eat. The Am I Hungry? Program provides guidance and direction in developing mindful strategies that support physical and emotional well-being, moving away from food obsession and away from a conflicted, maybe even tortured, relationship with food, away from shame and guilt-driven patters of starving and binging toward the joyful freedom of mindful eating. Imagine the simple peace of lovingly feeding your hunger, giving yourself food when you need food and not using food to fill emptiness and longings that food simply cannot fill. Imagine yourself eating joyfully when you’re hungry and mindfully stopping when you’re full. Through Am I Hungry? you can end the eat-repent-repeat cycle. You can learn eating behaviors that enable you to feel good, and attentive to your physical sensations and connected to your body. You can learn self-care skills and embark on a healing process of self-discovery, awareness, acceptance and positive change to a healthy relationship with food. If you want to live a better life you must first believe a better life is possible. Am I Hungry? is a research-based program that has been found effective in helping people eliminate emotional eating and binge eating behaviors. You deserve to enjoy food. Am I Hungry? tools and skills help you replace food obsession with food freedom. This program is offered though individual and group sessions.